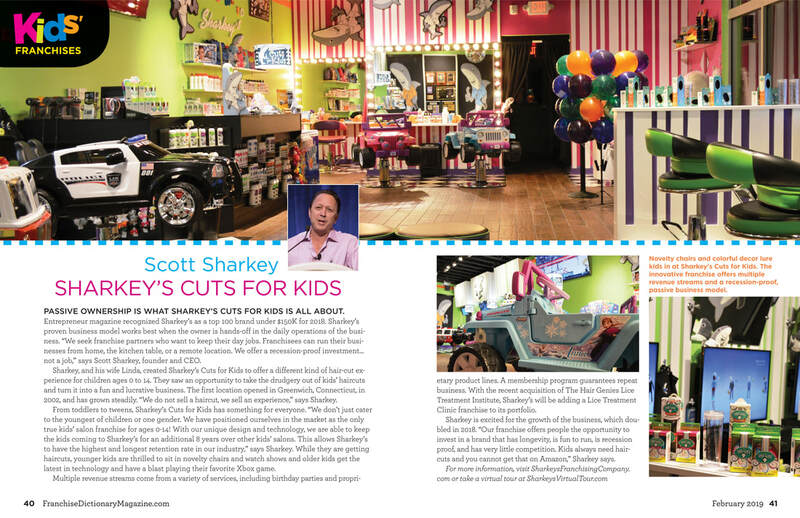 Sharkey's Cuts for Kids to Add 42 New Locations as Demand for The #1 Kids Salon Franchise Continues to Rise! Territories Selling Out Fast - Join Our Team Before the Back to School Season! Get Open before the Back to School Season - It's a Big OMG! Try and Get Open before the Back to School Season - It's a Big OMG! Territories Selling Out Fast - Do Not Wait! 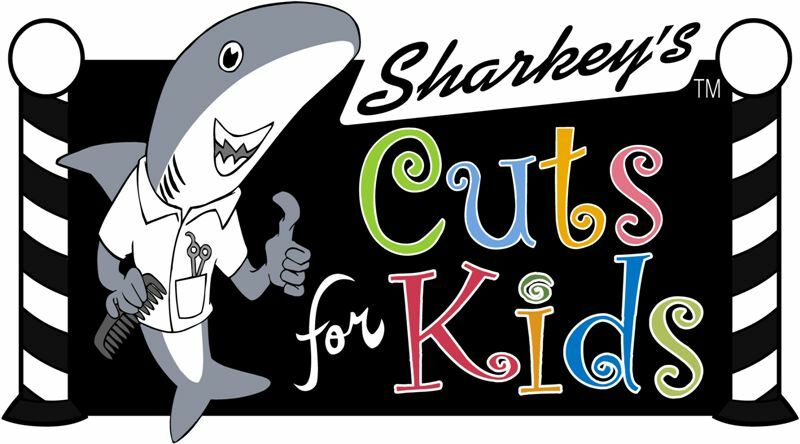 Step Inside a Sharkey's Cuts for Kids! Come See What We are Going to Build for You! XBox One on 40" Screens! 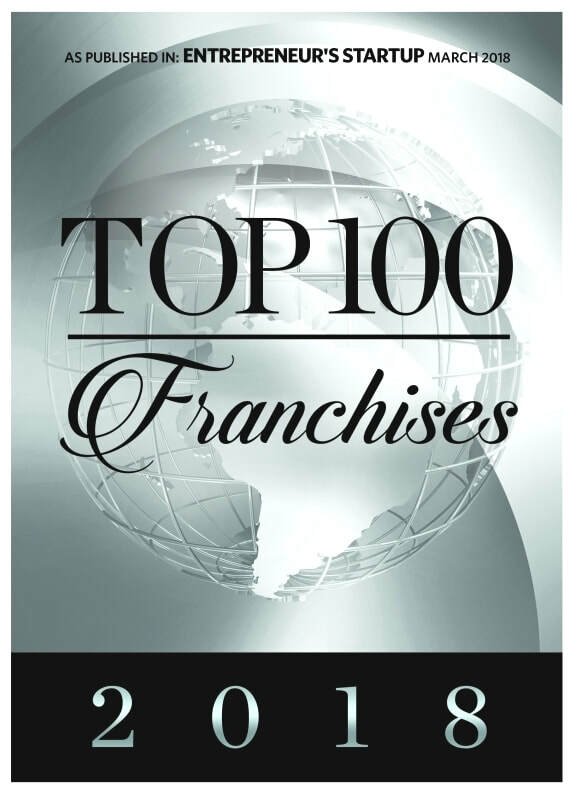 With more than 20 years in the franchise industry, I have insightful knowledge and a keen eye for opportunity. Every franchise candidate is unique. However, they almost all agree on one key reason to become a franchise owner: They see it as a good thing for their family. They are correct. 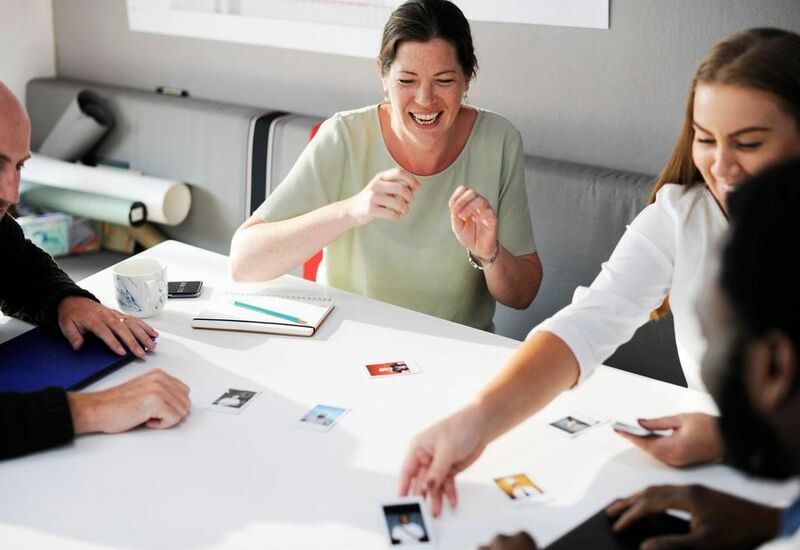 Studies show that business owners are happier than employees, with 43% of small-business owners saying they feel happy at work compared to 27% of their peers at large businesses. The 2017 State of Independence report found that 74% of independent workers were very satisfied with their choice -- the highest level in the seven years since the report began, and up from 65% in 2016. While it may seem intuitive, studies also show that happy parents have happy kids, with researchers believing as much as 45% of children’s happiness may be within their parents’ control. Seeing their parents work together as business partners as well as husband and wife feeds their sense of security while exposing them to the thrill of personal achievement. Happy parents + happy kids = one happy family. A family business teaches responsibility. Gone are the days when the majority of children were expected to work on the family farm or share much responsibility in keeping a household running. Children today live a life of leisure, sleeping late, hanging out with friends and spending countless hours staring at their devices. Some parents combat their children’s sloth with a few domestic chores or treat them with a pet that they must take care of, but they are years away from seeing how those efforts will translate into real-world success. While it may be difficult for children to find traditional employment before they are at least teenagers, children whose parents are sole proprietors of a small business can work there as early as age 12. That translates to years of extra work experience for children of entrepreneurs. That’s a lot of meaningful education for a child to learn about money, labor, responsibility, community engagement and, of course, entrepreneurship. Business owners control work-life balance. In her famous book, The Top Five Regrets of Dying, palliative care nurse Bronnie Ware records the top regrets that her numerous patients had during the last few months of their lives. One of those top five was “I wish I hadn’t worked so hard.” Ware said this was a regret of every one of her male patients, who specifically cited missing out on the youth of their children, as well as the companionship of their partners. Make no mistake, business owners work very hard -- but they do it on their own terms. They can work their schedules around family time if they choose, so they can be present for date nights, family dinners, birthdays, sporting events and anything else they want to attend. Family businesses are community partners. Many small businesses contribute to their communities in the form of time, labor or in-kind donation. They regularly spend time each week meeting with school leaders, nonprofits and other organizations seeking their assistance. Exposing children to philanthropy at a young age has taken on even more importance after a Harvard study revealed that a majority of youth appear to value aspects of personal success over a concern for others. This can encourage harmful behavior, including cruelty, disrespect, dishonesty and cheating. The family business exhibits what’s wonderful about personal achievement and ambition while teaching children how to give back to their communities. Perhaps the business will sponsor and participate in a building day with the local Habitat for Humanity chapter. Maybe they’ll set goals for providing gift certificates to local organizations hoping to use their product or service as a fundraiser. Whatever cause the business supports, including children in the effort will help them create a mindset of giving that can last a lifetime. Family businesses create a legacy. Many entrepreneurs choose to become small-business owners with an exit strategy of turning over the business to their children one day -- a strategy that takes on more importance in an era where young people are struggling to find gainful employment. Children who begin working in the family business at a young age will typically start an ascension into management after college, with an eye on purchasing some or all of the family business as their parents head into retirement. Often, the parents will retain a percentage of the business as a revenue stream in retirement, adding an extra level of responsibility for the child as a steward of their parents’ nest egg. Even if they don’t stay in the family business, studies show that parental entrepreneurship increases the probability of children’s entrepreneurship by about 60%. Children of entrepreneurial parents have already experienced many of the ebbs and flows of small-business ownership, which helps to mitigate their fears and raise their risk tolerance. So, whether they remain with the family business or not, the experience of participating in a family business still puts them on the path to happiness as an entrepreneur. We Love Testimonials... 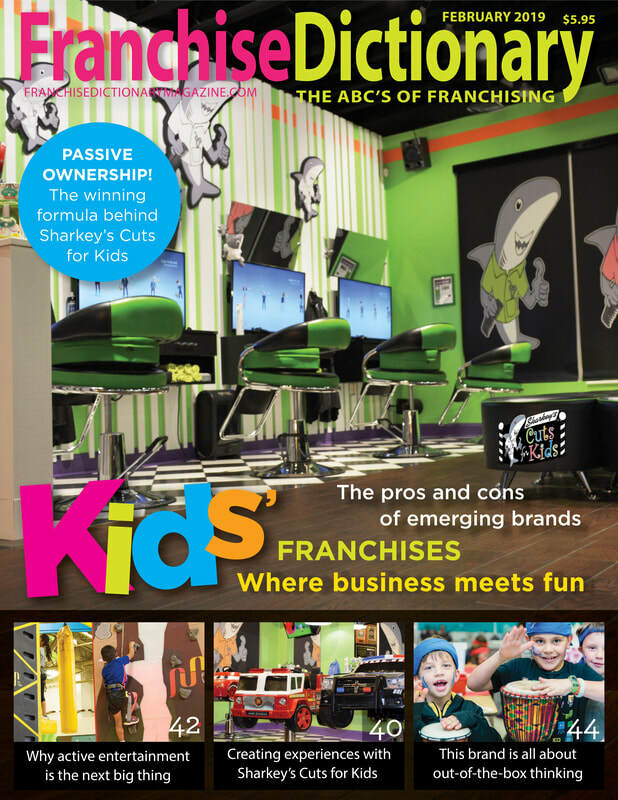 Thank You Franchisees for Your Kinds Words! Sharkey's Biggest Event Ever! Join Us! 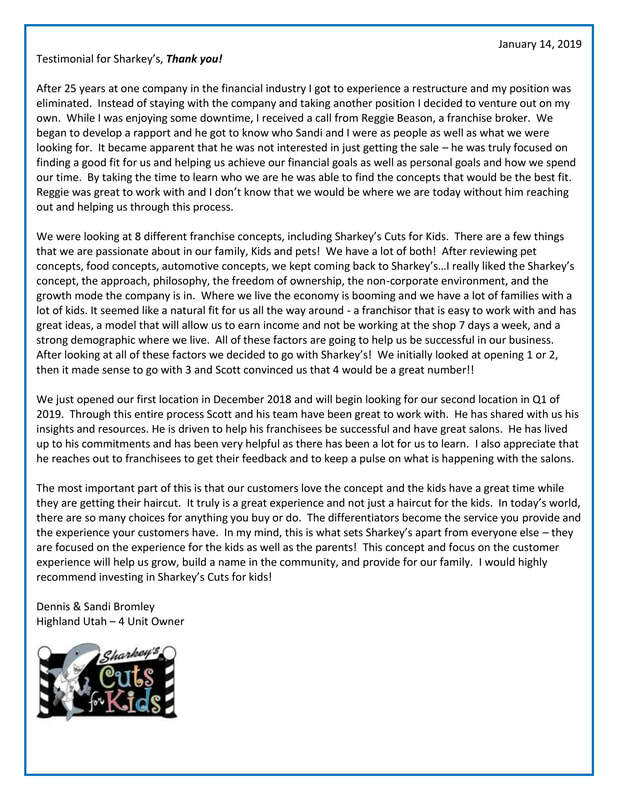 Testimonial for Sharkey’s, Thank you Sharkey's! After 25 years at one company in the financial industry I got to experience a restructure and my position was eliminated. Instead of staying with the company and taking another position I decided to venture out on my own. While I was enjoying some downtime, I received a call from Reggie Beason, a franchise broker. We began to develop a rapport and he got to know who Sandi and I were as people as well as what we were looking for. It became apparent that he was not interested in just getting the sale – he was truly focused on finding a good fit for us and helping us achieve our financial goals as well as personal goals and how we spend our time. By taking the time to learn who we are he was able to find the concepts that would be the best fit. Reggie was great to work with and I don’t know that we would be where we are today without him reaching out and helping us through this process. 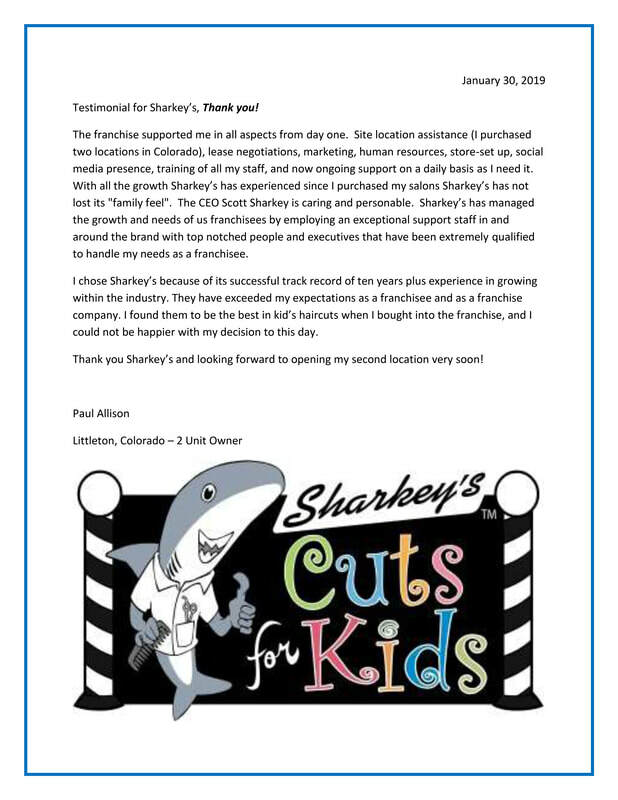 We were looking at 8 different franchise concepts, including Sharkey’s Cuts for Kids. There are a few things that we are passionate about in our family, Kids and pets! We have a lot of both! After reviewing pet concepts, food concepts, automotive concepts, we kept coming back to Sharkey’s…I really liked the Sharkey’s concept, the approach, philosophy, the freedom of ownership, the non-corporate environment, and the growth mode the company is in. Where we live the economy is booming and we have a lot of families with a lot of kids. 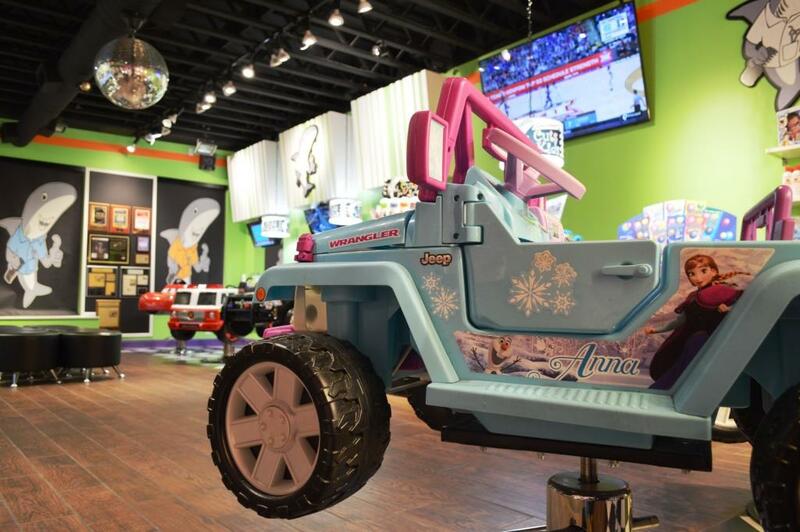 It seemed like a natural fit for us all the way around - a franchisor that is easy to work with and has great ideas, a model that will allow us to earn income and not be working at the shop 7 days a week, and a strong demographic where we live. All of these factors are going to help us be successful in our business. After looking at all of these factors we decided to go with Sharkey’s! We initially looked at opening 1 or 2, then it made sense to go with 3 and Scott convinced us that 4 would be a great number!! We just opened our first location in December 2018 and will begin looking for our second location in Q1 of 2019. Through this entire process Scott and his team have been great to work with. He has shared with us his insights and resources. He is driven to help his franchisees be successful and have great salons. He has lived up to his commitments and has been very helpful as there has been a lot for us to learn. I also appreciate that he reaches out to franchisees to get their feedback and to keep a pulse on what is happening with the salons. The most important part of this is that our customers love the concept and the kids have a great time while they are getting their haircut. 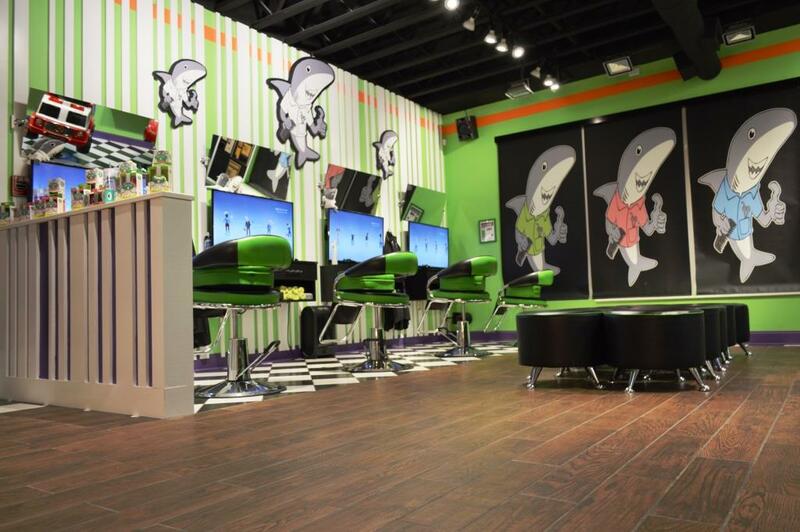 It truly is a great experience and not just a haircut for the kids. In today’s world, there are so many choices for anything you buy or do. The differentiators become the service you provide and the experience your customers have. In my mind, this is what sets Sharkey’s apart from everyone else – they are focused on the experience for the kids as well as the parents! This concept and focus on the customer experience will help us grow, build a name in the community, and provide for our family. 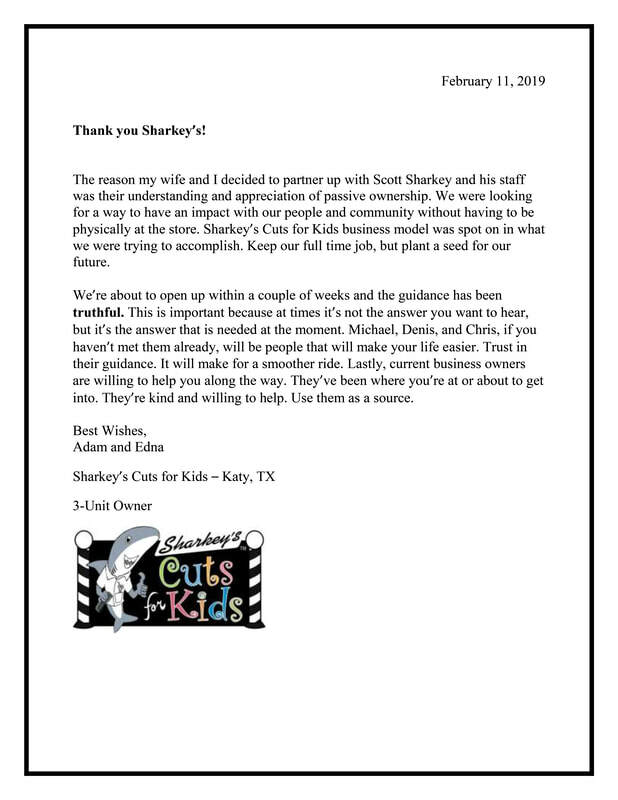 I would highly recommend investing in Sharkey’s Cuts for kids! It Continues to be a Great Day at Sharkey's Cuts for Kids! Record numbers already recorded for Q1/2019 as demand for Sharkey's continues to grow and territories sell out. "Our goal is to give people a PASSIVE OWNERSHIP opportunity, not a job, at a very nominal cost. Kids always need haircuts and you cannot get that on Amazon or delivered to your door in a corrugated box, says CEO Scott Sharkey." 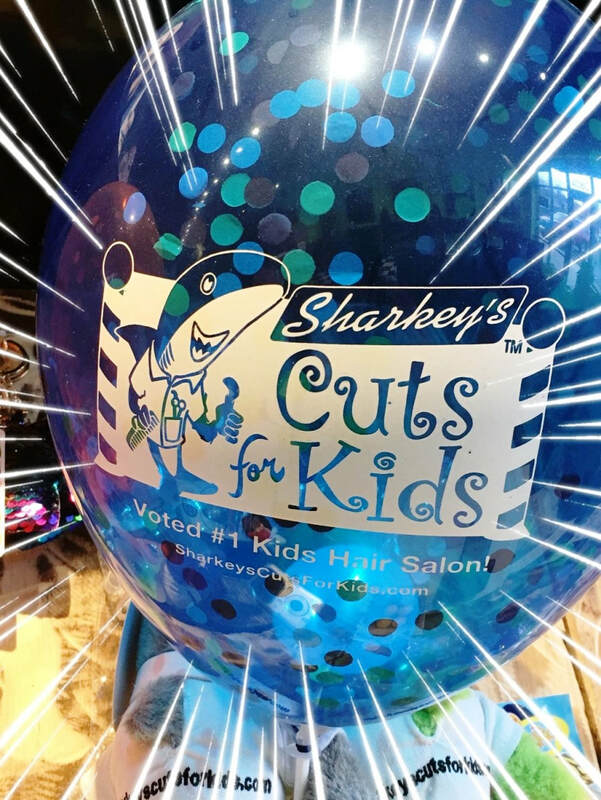 Sharkey's Cuts for Kids // Westport, CT // 1.203.637.8911 // Voted #1 Kids Salon!